Home BUSINESS CHARITY/ COMMUNITY SERVICE UMOJA FIRE: Company comes to the rescue of 32 kids who missed DAY 1 of third term. UMOJA FIRE: Company comes to the rescue of 32 kids who missed DAY 1 of third term. Vinepack's H.R. 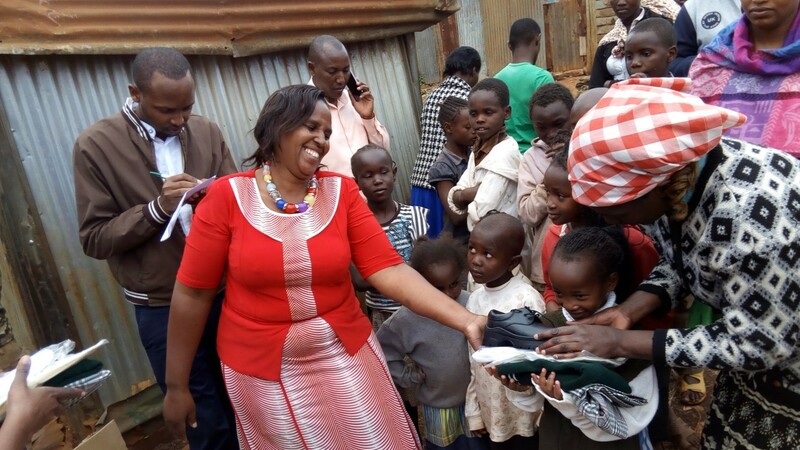 Manager Nancy Nyawira Gakuya giving one of the beneficiaries her set of uniform at Umoja Estate Thika. Behind him is the company's Marketing Manager Patrick Ben. 32 pupils form various primary schools in Thika West Sub-County missed the first day of Third Term due to various reasons as a result of the fire incident that hit Umoja residents a week ago. This was revealed on Monday as a team from Vinepack Limited visited the area to donate school uniforms to the affected children. Speaking to the press after the exercise, the company’s Human Resource Manageress Nancy Nyawira Gakuya narrated how they came to learn of this very unfortunate scenario after one of their employees missed work on Monday as she tried to ponder how she could manage a set of uniform for her two school going children after the fire. “When she failed to report to work this morning, I called her to know the reason why. After listening to her story, I decided to visit her but upon arriving here, I was shocked to learn that about 30 other children were in the same dilemma,” said Nyawira. Nyawira called her boss and narrated of the children’s and parents’ predicament after which the company resolved to provide all the affected children with a full set of uniform to ensure that their family were able to send them to school immediately. “We realised that these families are struggling to cover the costs of getting children back to school in for the final term of the year in the aftermath of the deadly blaze,” she added. She reckoned that their gesture was precipitated by the fact that children were the country’s future and missing school was so grave considering that education was their only hope out of poverty. She also expressed the importance of providing these uniforms noting that wearing a proper uniform was a basic need which boosted the confidence of learners and lead to greater performance in achieving good results. “It isn’t hard to imagine what will become of children living in poverty; their education suffers because poorly fed children simply can’t learn as well as their well-fed peers. It is difficult for them to focus in school when all they have to worry about is whether they will get the next meal,” she explained. The company’s Marketing Manager Patrick Ben expressed the need for companies within the region to pool resources together and come up with a fund to assist the less fortunate in the society. “As a society that is based on values that exhort the care of the poor and destitute, we should not allow this state of deprivation to continue. As companies in this region, we can use our power and persuasion to change this despicable situation of our people,” said Patrick. He reckoned that there was no joy or nobility in a society that turned its back on its most vulnerable. He said that companies could participate, not only through cash donations, but also volunteer their time, skills and creative insights to help those in need, whether helping out in simple ways or seeking solutions to their local challenges. In this way, he added, they would help make a meaningful difference in the lives of others and have an enduring impact on the communities where they live and work. Patrick noted that the economic state of the people living in slums and poor urban communities had significant impact on the overall economic growth of the entire country. This meant that the companies could come up with programmes that ensured youth from such areas got virtual access to resources and mentors.